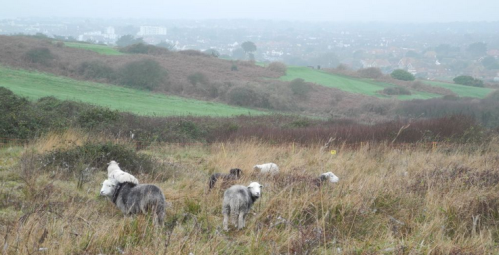 Seaford Town Council and Sussex Wildlife Trust are pleased to announce that they have welcomed back sheep and cattle to carry out grazing on the Nature Reserve at Seaford Head. Sussex Wildlife Trust has been managing the 83 hectare site for Seaford Town Council since June 2013. Coordinating the conservation work is the Trust’s Assistant Reserves Officer, Sarah Quantrill. The sheep and cattle have been brought back to the reserve for a second time as part of the management plan that was commissioned by Seaford Head Local Nature Reserve Committee to provide a guide on the best possible management for the nature reserve over the next five years, 2013 to 2017. The first round of grazing achieved very notable positive results so it has been decided to repeat the grazing. There are 29 Herdwick sheep which will graze the area for a few months to help control the vegetation. 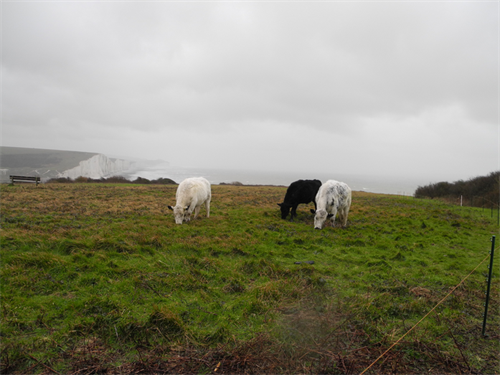 Also there are three cattle, which are a particularly good breed for conservation grazing and will help control the coarser grasses and scrub, contributing to the improvements on this area of chalk grassland. The sheep are on site now and cattle due to be introduced any day. There is temporary electric fencing around both areas of grazing. All the animals are checked daily, with access to water. Dog owners should keep their dogs under close control or on a lead when in the vicinity. If they are approached by cattle they should let the dog off the lead. There are information signs on both grazing areas, including the contact number for the grazier in an emergency; 07884496807. 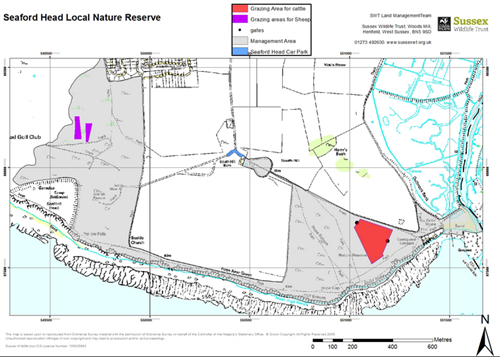 Anyone wanting more information on the nature reserve or with an interest in joining one of the voluntary groups that currently help care for the reserve, should in the first instance contact either Seaford Town Council on 01323 894870 or admin@seafordtowncouncil.gov.uk, or speak to Sarah Quantrill on 01273 492630.